When you make changes in the document setup, additional preferences dialog pops up after you click OK in the Document Setup dialog. Select corner, side or center to which you want the objects to stick when page size changes. Objects on resized pages will retain their spread-relative coordinates. When the page size changes considerably, the objects can shift off the page. Frames and paths will be resized proportionally with the page. Character settings, stroke weights and images will remain unchanged. Frames and paths will be resized proportionally with the area inside margins. Character settings, stroke weights and images will remain unchanged. 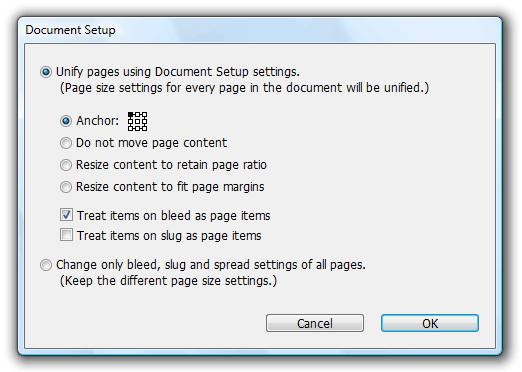 Treat items in bleed as page items - Objects with center placed off the page, but inside the bleed area will be moved or resized as set in Content Options. Treat items in slug as page items - Objects with center placed off the page, but inside the slug area will be moved or resized as set in Content Options. Sizes of pages will remain unchanged and only the changes you've made to settings of Bleed, slug or facing / non-facing pages will propagate thorough the document.